Robert McCloskey wrote a lot of summery picture books. 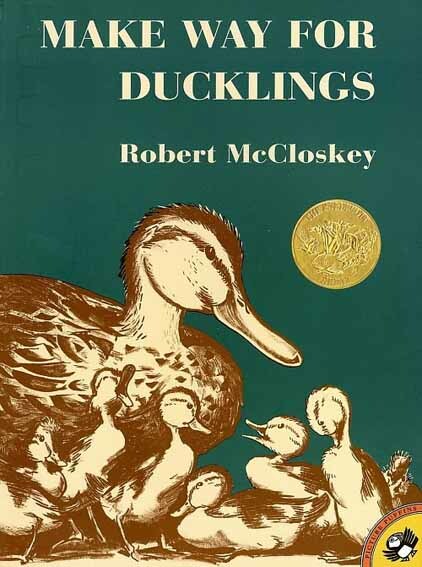 You probably know Robert McCloskey because of Make Way for Ducklings, which is super famous (especially in Boston) because it’s adorable and because, fun fact, he got some ducklings drunk in his apartment and drew them. * However, he also wrote and illustrated a lot of other children’s books, most of which are fabulous summer reads. We were talking about Make Way for Ducklings, but we didn’t feel like it was very summery, and we think that’s because it’s printed all in a single color, and that color is brown. But Blueberries for Sal and One Morning in Maine are printed all in blue, which feels lighter and happier. And one of them is about picking blueberries in the country and the other is about clamming and eating ice cream on the coast, which feel pretty summery to us. Burt Dow, Deep Water Man, on the other hand, is absolutely bursting with color, because Burt and his little fishing boat get swallowed by a whale and he needs to paint the insides of the whale’s belly with leftover boat paint to prompt some reverse digestion and achieve freedom. **Oh, wait. It’s still fairly horrible. This entry was posted in July 2014 and tagged blueberries for sal, burt dow deep water man, July 2014, kidlit, maine, make way for ducklings, McNally Jackson, ocean, one morning in maine, picture books, robert mccloskey, summer, summer reads, time of wonder. Bookmark the permalink.